Styled in elegance and durability, the full back dining chair from Worldwide Homefurnishings Inc. makes an excellent addition to any dining table. Perfect for both busy kitchens and elegant settings, this chair comes designed with a grey fabric seat and grey manufactured wood frame. This stunning parson dining chair from !nspire is a stylish addition to any dining room table. Complete with a grey polyester/polyester blend seat and chrome metal frame, this chair can withstand a busy, yet elegant home. This stunning parson dining chair from !nspire is a stylish addition to any dining room table. Its grey linen seat and grey wood frame give it an elegant, yet strong practicality that suits a variety of spaces. This beautiful parson dining chair from !nspire brings a touch of style and elegance to any dining room table. Complete with a grey polyester/polyester blend seat and walnut solid wood frame, this chair can withstand a busy, yet elegant home. Bring a touch of elegance and style to any dining room table with the parson dining chair from !nspire. Its grey metal seat and grey metal frame give it an elegant, yet strong practicality that suits a variety of spaces. 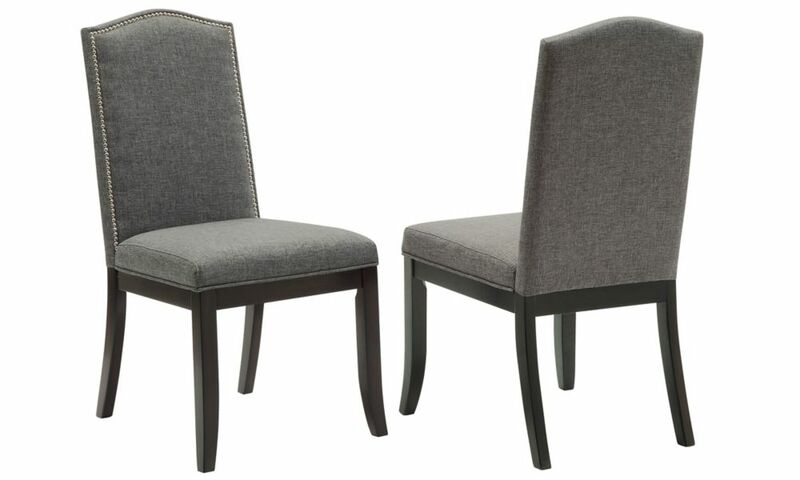 Jazz Manufactured Wood Grey Full Back Armless Dining Chair with Grey Fabric Seat - Set of 2 Styled in elegance and durability, the full back dining chair from Worldwide Homefurnishings Inc. makes an excellent addition to any dining table. Perfect for both busy kitchens and elegant settings, this chair comes designed with a grey fabric seat and grey manufactured wood frame.